Brigadier General Joseph Lester Stewart, who earned the Silver Star Medal in the Korean Conflict, retired from active service in the Marine Corps, November 1, 1965. General Stewart was born May 31, 1915 in Newton, Alabama, and graduated from Butler County High School in Greenville, Alabama, in 1933. He was awarded a Bachelor of Science degree, May 31, 1937, upon graduation from Auburn University and was designated an Honor Graduate scholastically and of the ROTC course there. While in college he was a three latter athlete. He was commissioned a Marine Second Lieutenant on July 28, 1937. Lieutenant Stewart completed Basic School at the Philadelphia Navy Yard In May 1938, then served for one year with the Marine Detachment aboard the USS CALIFORNIA. This was followed by assignments with the 1st Battalion, 6th Marines, and the 2d Battalion, 10th Marines. In September 1940, he was promoted to First Lieutenant. He graduated from the Battery Officers Course at Fort Sill, Oklahoma, in May 1941, returned to the 10th Marines. When World War II broke out, Lieutenant Stewart was deployed with the 2d Marine Brigade for American Samoa as Commanding Officer of B Battery, 1st Battalion, 10th Marines, in January 1942. He was promoted to Captain in February 1942, and remained overseas until August. In September 1942, he was promoted to Major, and in October attended the Field Officers Course at Fort Sill. Upon completion, he commanded the Artillery Battalion of the Training Artillery at Camp Pendleton. In 1943, he completed the Command and General Staff School at Fort Leavenworth, Kansas. Ordered to Kiska, Alaska, in July 1943, Major Stewart served on the Staff of the Amphibious Corps, Pacific Fleet, during the Aleutian campaign. From September 1943 through October 1945, he served in the Pacific area as Executive Officer, G-5 Section, V Amphibious Corps. He participated in combat at Kwajalein and Eniwetok in January and February 1944. Later, following his promotion to lieutenant colonel, he took part in the Saipan-Tinian and Iwo Jima campaigns, earning the Legion of Merit and the Bronze Star Medal, both with Combat "V". He also participated in the occupation of Japan then returned to the United States in December 1945. 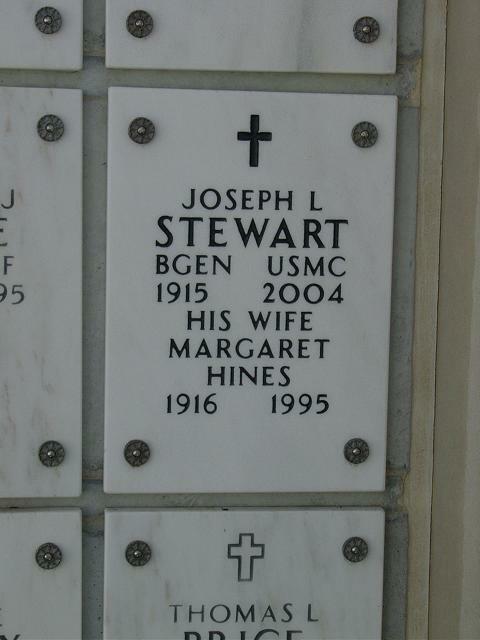 Lieutenant Colonel Stewart served as an instructor in the Senior Course, Marine Corps Schools, from January 1946 through June 1949. In July 1949, he joined the 1st Marine Division at Camp Pendleton, California, serving as Assistant G-3, Commander of the 1st Battalion, 5th Marines, and Division G-3, respectively, until June 1950. Upon the outbreak of the Korean Conflict, Lieutenant Colonel Stewart was ordered to Korea where he served as G-3 of the 1st Provisional Marine Brigade and later as assistant G-3 of the Division. He participated in action at the Pusan Perimeter and in the assault and seizure of Inchon. 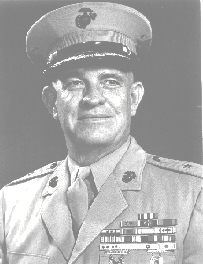 Subsequently, as Executive Officer of the 5th Marines, he took part in the bitter Chosin Reservoir campaign in November and December 1950; and commanded the 3d Battalion, 5th Marines in the first United Nations counteroffensive early in 1951. The Silver Star Medal was awarded Lieutenant Colonel Stewart for conspicuous gallantry as Executive Officer, 5th Marines, in Korea, December 3, 1950, during his regiment's attack from Yudam-ni toward Hagaru-ri against elements of three enemy divisions. He was also awarded his second Legion of Merit and his second Bronze Star Medal, as well as an Air Medal for his service in Korea. Following his return from Korea in June 1951, he was assigned to Headquarters, Fleet Marine Force, Pacific, as Assistant G-3 and later G-3. He was promoted to colonel in November 1951. In August 1953, Colonel Stewart began a three-year assignment at Headquarters Marine Corps where he served consecutively as Assistant G- and Head of the G-4 Planning Branch. In August 1956, he entered the National War College, Washington D. C. Following graduation in June 1957 he assumed duty as Deputy Plans Director on the Staff of the Supreme Allied Commander, Atlantic (SACLANT), at Norfolk, Virginia. In September 1958, he was named Assistant Chief of Staff, G-3, Fleet Marine Force, Atlantic. Colonel Stewart departed from Norfolk for Marine Corps Schools, Quantico, in August 1959. There he served as Director of the Senior School until May 1961, when he became Deputy Director of the Marine Corps Educational Center. He was promoted to his present grade of brigadier general in August 1962. From September 1962 until March 1964, General Stewart served as Commanding General, Force Troops, Fleet Marine Force, Pacific, and Commanding General, Marine Corps Base, Twentynine Palms, California. In April 1964, he was designated Director of the Marine Corps Reserve, and served in this capacity at Headquarters Marine Corps until his retirement. He was awarded a third Legion of Merit upon retirement. A complete list of the general's medals and decorations Includes the Silver Star Medal, the Legion of Merit with two gold stars in lieu of second and third awards, the Bronze Star Medal with Combat "V" and Gold Star in lieu of a second, the Air Medal, three Presidential Unit Citations, the Navy Unit Commendation, the American Defense Service Medal, the American Campaign Medal, the Asiatic-Pacific Campaign Medal with four bronze stars, the World War II Victory Medal, Navy Occupation Service Medal, the National Defense Service Medal, the Korean Service Medal with four bronze stars, the United Nations Service Medal, the Korean Ulchi Medal with Silver Star, and three Korean Presidential Unit Citations. General Stewart and his wife, the former Margaret Hines, have two daughters: Margaret Allison (born December 18, 1946), and Barbara Lynne (born August 12, 1950). Brigadier General Stewart passed away on 27 December 2004.